Homemade Roasted Veggie Cream Cheese for a Perfect Lox Bagel. Super toasty bagel people raise your hands. We have our own little clique. Toasted and golden, no warm bread please. If I come across a hugely fantastic breakfast spread, a bagel bar, if you will – with loads of cream cheese flavors and toppings and drizzles and fruits and nut butters and even vegetables, but no toaster? I simply can’t do untoasted bagels. Why are they even allowed to be a thing? A few weeks ago, a craving for smoked salmon (or lox, I believe they are sliiiiightly different, as in lox isn’t actually smoked?) on toast hit me HARD. The only thing I had that was crunchy and toast-like were a bunch of seedy crackers, so I made a snack plate of cream cheese on crackers. Topped with avocado, salmon, salt, pepper and a drizzle of toasted sesame oil. It made my life. And it’s SUCH a filling but light wonderful lunch. Or snack. Or breakfast. Or everything. One night I wanted it for dessert? If that doesn’t say my taste buds might be changing, I don’t know what does. I’ve picked savory over sweet a bunch of times recently and am like WHO ARE YOU to myself. This roasted veggie cream cheese is everything. There have been very few times in my life that I’ve picked veggie cream cheese out of the options I’m given. Mostly because I’m pretty sure the store bought versions contain carrots? And celery? So while you won’t find those things in my version of cream cheese (though you can obviously add them and not listen to a brat like me), you will find diced peppers and onions and garlics, roasted to perfection. A little bit of char, juicy and naturally sweet, flavored to heaven and back. SO delicious. And just when I thought that it couldn’t get much better than roasted veggie cream cheese and silky salmon, I did something else. Thinly sliced, heavily seasoned avocado. Ooomph. Thinly sliced, toasted sesame cucumbers. Eeeeep. The taste. The texture! It’s a locked and loaded bagel. Preheat the oven to 400 degrees F. Line a baking sheet with parchment paper. Add the peppers and red onions to the sheet and toss with garlic, olive oil, salt and pepper. Roast for 15 to 20 minutes, tossing once, until caramely and sweet. Place the cream cheese in a large bowl. Add the roasted veggies and sliced scallions. Mix thoroughly to combine. (You can use a food processor if you want, but I like the chunks!) This keeps great in the fridge for a few weeks. 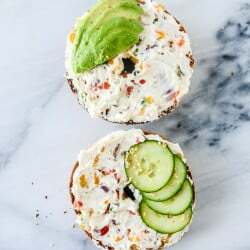 Cover the bagel with your veggie cream cheese. In a bowl, toss the cucumbers with the oil and sesame seeds. Spritz the avocado with the lemon and season with the salt and pepper. 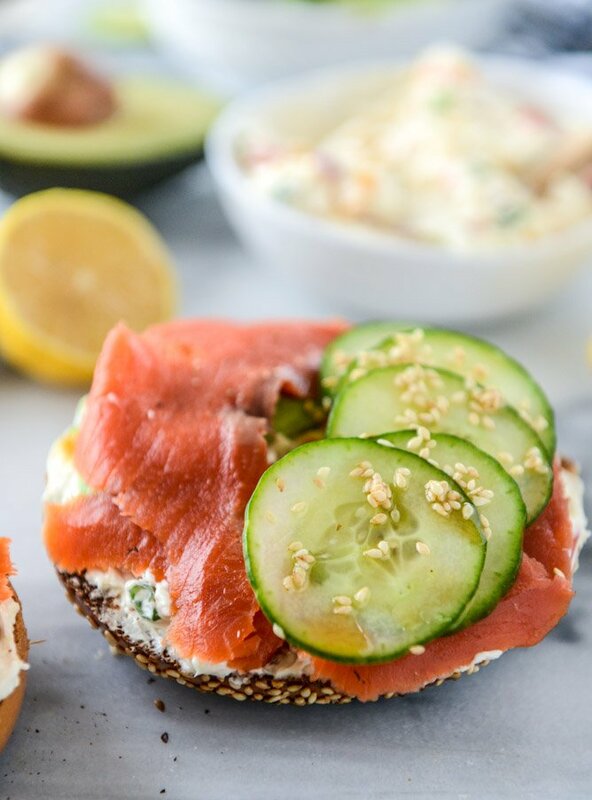 Build your bagel by adding the cucumbers, avocado and salmon on top!